Bertrand Russell once said, “Most people would rather die than think; in fact, they do so.” A recent research study at the University of Iowa, Tippie business school, seems to confirm that. Researchers found that people are reluctant to change their minds and adapt their views, even when new information has been presented. This holds true even if they stand to lose money. The phenomenon is called “confirmation bias” and apparently operates at a subconscious level at all times. The new research confirms numerous previous studies undertaken over ten years which show people invariably stick to their original viewpoint even when new facts contradict those beliefs. 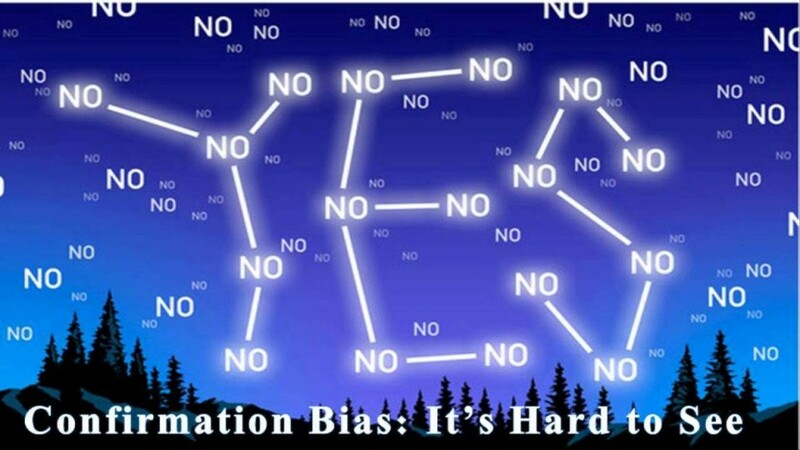 Confirmation bias is the tendency to look for evidence that confirms our existing beliefs and practices, rather than considering alternative possibilities, despite having access to new data to influence them. When faced with facts that don’t fit, we tend to ignore or change them to fit our beliefs. the spirit world were terrified of him. They quaked in fear as he delivered people from their control. The spirits, were it seems, the only ones who recognized Jesus was divine. What about those who knew him best of all, his family? Jesus family knew him well, or so they thought. He had given up his trade as a carpenter, left his family in Nazareth behind, move to Capernaum, become an itinerant preacher and healer, and depend on the charity of other to live. And at times he was too busy to eat and care for himself. He must be mad they thought. The spirits recognized Jesus was divine. His family thought Jesus was deluded. “And the teachers of the law who came down from Jerusalem said, “He is possessed by Beelzebul! By the prince of demons he is driving out demons.” (Mark 3:22-23). The teachers of the law in Jerusalem were the religious and judicial experts. Their considered opinion was that Jesus was satanic. They didn’t deny his ability to perform exorcisms, merely that He was using black magic to do it, in league with Satan. And their language was obnoxious and offensive. Beelzebub means “Dung god”, a derogatory name for the “Fly god” worshipped by the Philistines. So the people who met Jesus came to three very different, mutually exclusive, conclusions. Jesus was deluded to some, demonic to others and to a few he was divine. What had Jesus to say for himself? How does he answer these claims? The lines were drawn. The demons were control by Satan. Jesus would give authority only to those who submitted to his authority. Only when the disciples understood who Jesus was and why he had come, could they become his ambassadors. Jesus silences the demons. Jesus demolishes their foolish, inconsistent logic. “If I am delivering people from Satan how can I be working for Satan?” And Jesus warns them, continue to think like that, you are going to hell. What is the “unforgivable sin”? The religious leaders had maligned him because he threatened their authority. But his own family thought he was delusional too. Whatever the reason, his mother and brothers came to take him home to Nazareth. He was suffering from Messiah syndrome. Mark Galli observes, “We tend to romanticize such sayings”. Some make them fit preconceived notions about Jesus meek and mild, learnt in Sunday school. Others think Jesus justifies their individualism. No, Jesus will not conform to our romantic Sunday school memories nor endorse our rebellious nature. Jesus words are both sober and reassuring. So, Jesus does not despise his mother, but reminds her of and points her to her God, his Father. For she too needed a Saviour. And it seems his tough love worked because Mary and several of his brothers, like James and Jude, eventually trust Jesus as their Lord and Saviour. So, Jesus rebukes the leaders and chastises his family but adopts all who trust in him, into his family. We have considered how Jesus was perceived and how Jesus responded. So What do you make of Jesus Christ? This passage makes it very clear that opinion on Jesus was divided. And it seems Jesus did not make it easy for people to become his followers. Then as now, He is not interested in superficial commitment or merely intellectual assent. He calls us into a deep and lasting family relationship. “Whoever does God’s will, is my brother and sister and mother.” (Mark 3:35). And the closer we identify with Jesus, the more likely we are to be maligned or misunderstood, but the closer we will grow to his family. Why be a member of a local church, when it is as fallible and fallen as our natural families? “For where two or three gather in my name, there am I with them” (Matthew 18:20). Among these two or three, or two or three thousand, Jesus will be found. We gather because we know the dangers of trusting one’s solitary judgment in spiritual matters. So what do YOU make of Jesus Christ? Perhaps it is not so much a question of what we make of Jesus but rather of what he makes of us. Lets pray. This entry was posted in Bible, Sermons, Theology on November 22, 2015 by Stephen Sizer.